Don’t you just love this time of year—when clothes wearing is at a minimum and afternoon drinking in the sun is at a maximum?! What can’t Eau De Vie do? We mean, just look at this thing! That ‘steam’ coming off the top of the drink is actually an essential oil fog (who even thought that was possible? Let alone on a drink!) and sits above a tingling mix of gin, Martini Rubino, Campari, Braulio and Cuban pepper bitters. The ingredient list of gin, Lustau East India Solera Sherry, and house-made Horchata de Alemendra de Chufa may make absolutely no sense to you, but all you need to know is that this flavour bomb is then served with bitter chocolate almond & tiger nut granola balls. Hey The Smith, can we get a hell yeah?! What do we love about this cocktail? Rockmelon juice. Seriously, we need more rockmelon juice in our life. Accompanied with gin, triple sec, lemon, lime, liquorice bitters and caramel syrup, fennel sprouts and edible flowers top things off, make this one drink you need to taste next time you’re at Union Electric. You know this drink is going to be legit when it’s named in Italian! Meaning ‘the scent of seduction’, if the baby blue hue doesn’t have you ordering two straight up, then the divine ingredient mix of gin, Creme De Violet, blood orange, egg white and lemon juice flavours, will surely crush any hesitation next time you’re at Vaporetto. 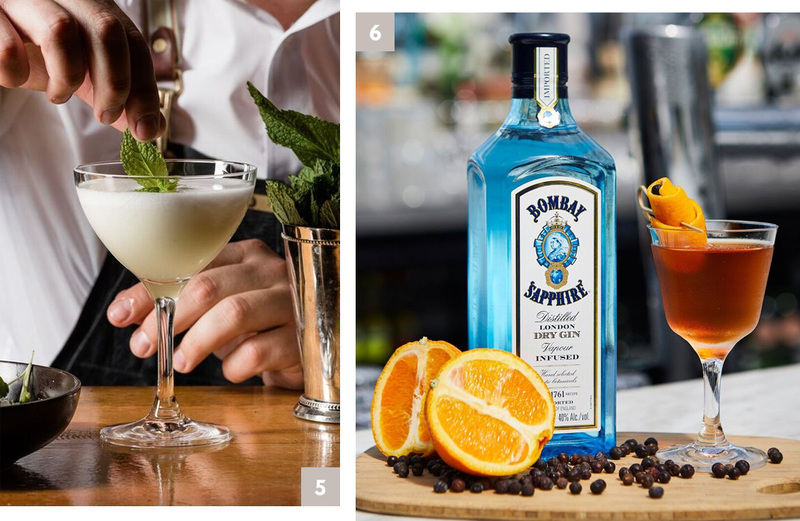 Taking inspiration from Africa, this beverage extraordinaire consists of gin mixed in with lemon juice and pear liqueur, which is then topped off with cardamom syrup, egg whites, mint leaves and sumac—­ a spicy mix from the guys at 1806. The Emerson definitely delivers with this one. Juniper berries are muddled with gin, Martini Rosso, Amaro Averna, a dash of bitters and then served in a chalice that is fit for a king (or queen!). Not content with settling for the original colour of the cocktail, the guys of Bar None in Camberwell use citric acid solution to change up the hue of the La Aurora, because why not?! Gin, limoncello, tarragon vinegar shrub and lemon bitters are topped off with gold shimmer, just in case you thought this cocktail wasn’t impressive enough. 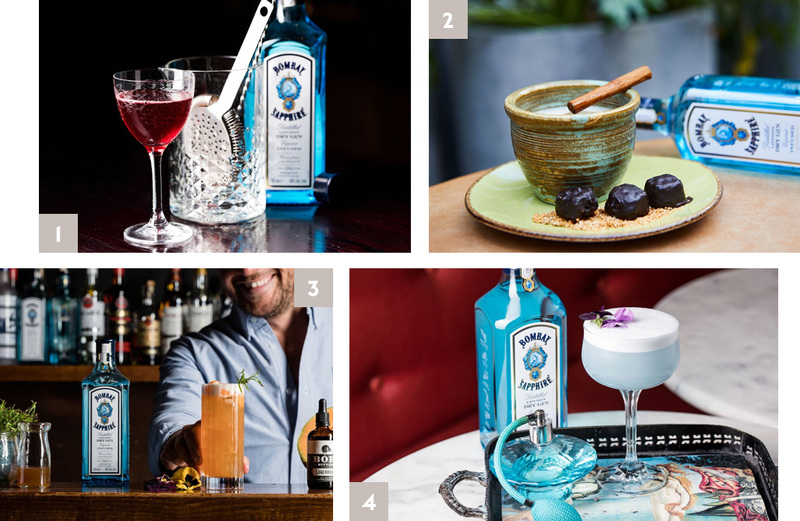 Inspired by the famous blue themed botanical garden in Morocco, clarified almond milk is spiced with coriander seeds, nutmeg, cinnamon, sumac, cardamom, pimento and vanilla bean, then added to gin, Dom Benedictine and edible gold glitter, and finally garnished with pomegranate molasses (shaped into a rose) and spice flavoured paint on the outside of the glass (say what!?!). Polly Bar, take a bow! Get your heart going with this Martini variation, with the mix of gin, vermouth, Absinthe and lemon giving you one hell of a kick. Like seriously, this drink from Gin Palace is not for the faint-hearted. Concocted by the team at Cookie, you can bet that the Star Gazers Swizzle is a winner. 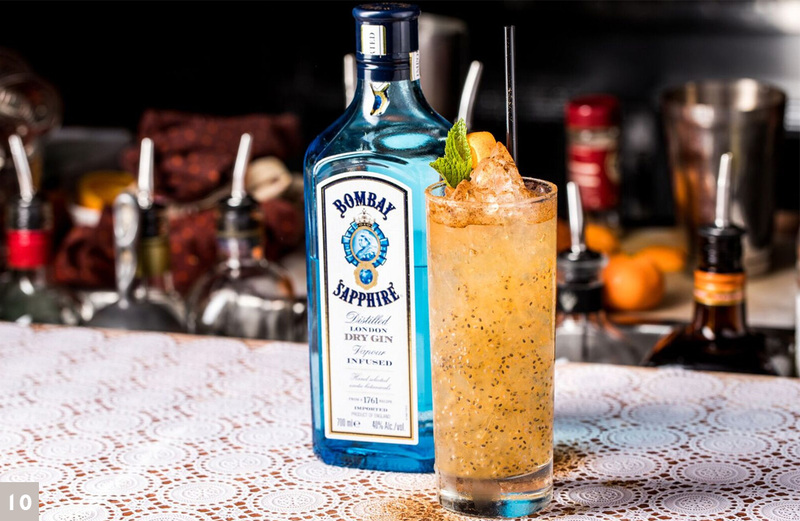 A combination of lemon juice, Cassia Bark and Mandarin reduction (did someone says ~fancy~), chia seeds and plenty of the good stuff (Bombay Sapphire, obviously), we'll take two please. 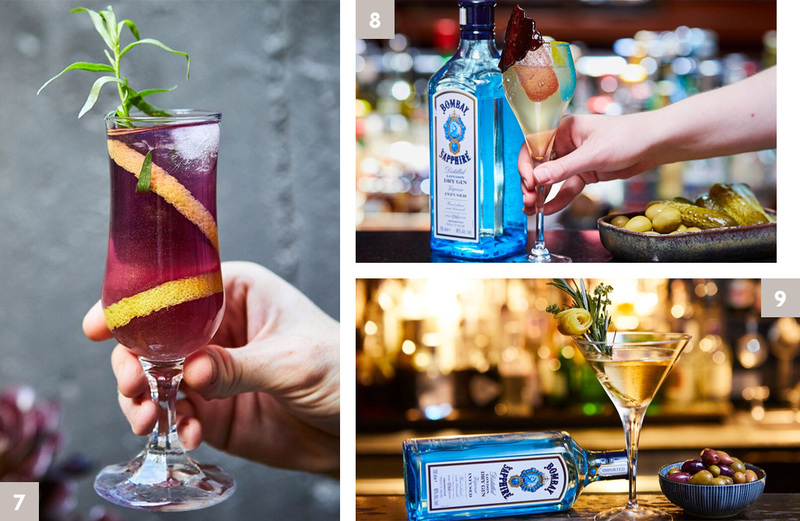 So take your Sunday sesh up a notch with one of these Bombay-inspired beverages, because let’s be honest, it’s 2017 and a vodka, lime, soda just does not cut it anymore!